Modern motorcycle elmets are constructed from an inner EPS “Expanded Polystyrene foam” and an outer shell to protect the EPS. The density and the thickness of the EPS is designed to cushion or crush on impact to help prevent head injuries. They are generally designed to distort in a crash (thus expending the energy otherwise destined for the wearer’s skull), so they provide little protection at the site of their first impact, but continued protection over the remainder of the helmet. 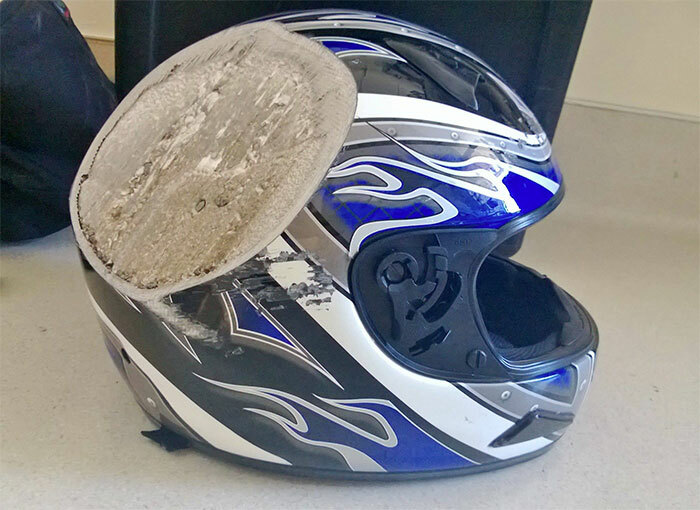 Continue reading for more examples showing why you should always wear a helmet.